When it comes to IPAF, PASMA and ladder training courses across Southampton, there's nobody better than Kingfisher Access! As one of the UK's leading PASMA, safety, IPAF and ladder training course providers, we have a huge range of training courses and programmes available, covering a variety of first aid, scissor lift, cherry picker, working at height and safety harness categories. We'll pass on the decades of practical experience and technical knowledge of our experienced and friendly tutors through our extensive training courses. So if you're based in Southampton and know which course you need, simply go to our 24/7 course selector and booking form, fill out your details and book your place on the course today! When you run a business, it can be very difficult to find a convenient time to send your staff off for training, especially as it will take them away from the business for many hours. At Kingfisher Access, we have the solution! We offer truly bespoke training programmes and courses that take place every day of the week, overnight, in the evening and at weekends. Quick and easy course booking! If you have found the ideal PASMA, IPAF or ladder training course for you and your staff, just visit our 24/7 booking section and course selector, fill out your details and then book your place on any one of our trusted and accredited training courses today. We offer a comprehensive range of PASMA approved and accredited training courses, each including fully hands-on practical demonstrations and 3T and Advance Guardrail assembly and dismantling assessments. So if you want a highly effective, proven and affordable way of training your employees to effectively and safely use any first aid, working at height or safety equipment, our PASMA training courses are the perfect option. You and your employees will safely get the best out of each machine thanks to the comprehensive range of IPAF training courses that we have available. As one of the UK's leading training centres, we have achieved full IPAF approval and accreditation. As you would expect, the quality standards we set here are accepted everywhere across Hampshire and the rest of the UK. 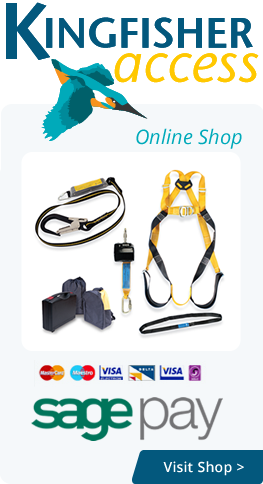 Plus, the Powered Access Licence you will receive will carry real weight. You'll be surprised to hear it, but ladders and step ladders are still commonly used throughout Southampton and the UK. That's why it's still very important that the proper inspection, selection and training is carried out. Provided at our London and Essex training centres and at business premises across Southampton and Hampshire, our ladder training courses are ideal for supervisors, managers and users alike, so book your places for you and your employees today. So if you're based in Southampton, or anywhere else across Hampshire, speak to the MEWP, IPAF, PASMA and safety training experts at Kingfisher Access today. Simply book your course via our fully 24/7 course booking system or contact us for more information.